A plant’s leaves are solar panels. They collect the energy of the sun and convert it into a usable energy source for the rest of the plant. This fuels the life of the plant – from growth to reproduction. Some plant leaves, like some solar panel setups, even have the ability to track the sun as it moves across the sky thus maximizing the collection of the sun’s energy. Each species of plant has a particular season in which its solar panels are actively collecting light. A Big Bluestem plant, for instance, begins growing its solar panels in April or May when the temperatures have become adequately warm, and, being a warm season grass, Big Bluestem solar panels quit functioning with the onset of cooler fall temperatures. Compare this to Virginia Wild Rye, a cool season grass, that has active solar panels in the cool seasons of the year, around February or March through June or July and again in September through November or December. This is all just basic plant biology, but here at Hamilton Native Outpost, we have begun thinking a lot about how to apply this to native planting projects. Here are some of our thoughts. Quantity and quality of forage is the name of the game. 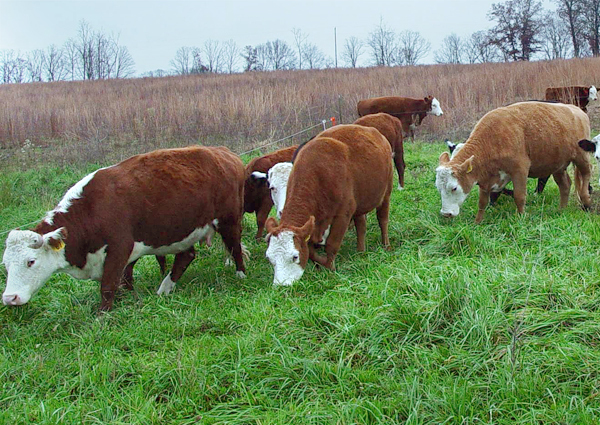 Adding diversity to a pasture can significantly increase yields. In fact, one study found that a mix of fifteen natives can produce 238% more above ground biomass than a monoculture of Switchgrass, which is considered one of the highest biomass producing grasses (Kintisch, 2008). As graziers, this thought intrigues us! We attribute this, among other factors, to the increased season of solar panel activity; the increased diversity of plants increases the portion of the year that plant material is being produced. At Hamilton Native Outpost, we are looking into this concept with a diverse native planting of our own designed specifically for grazing. If you want to learn more, join us for our Pasture Walk (more event details). Cool Season ground in foreground and warm season grass in background. Pollinators need flowers in each season to provide nectar. Deer eat plants that are growing and tender. Birds will be found where the insects are, and the insects will be found on new, fresh growth. A diversity of plants each with their unique season of solar panel activity is what will provide the best quality wildlife habitat. Choose plants or mixes that grow in the different seasons. This will result in blooms throughout the growing season instead of only one season. It can also decrease the annual weeds in an established planting as there is likely always some species of growing plant covering the ground with its solar panels; periods of time with exposed bare ground result in a quick growing, usually annual, weed covering the ground with its own solar panels. A high quality natural ecosystem will have many different species, and between them there will be growth from very early spring to very late fall as each species takes its turn at putting out its solar panels. 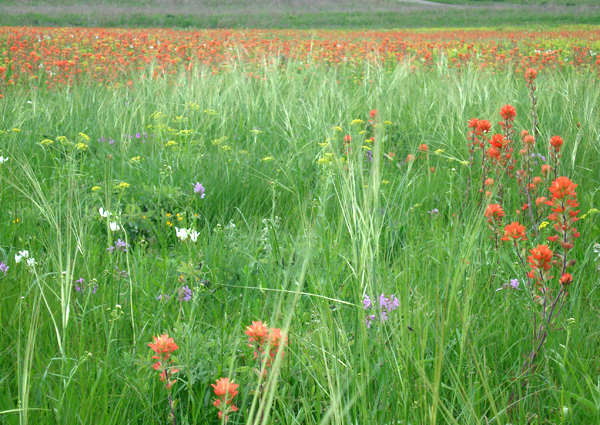 When recreating a prairie, glade, or savanna, diversity is a good thing. Kintisch, E. 2008. Minnesota ecologist pushes prairie biofuels. Science 322: 1044-1045.